mid-Seventies the TY 250 Mono took the feet-up world by storm when it appeared on the scene in the Eighties. Here was a clubman bike that could tackle the world – in semi trail ‘S’ form it was mass produced with road gear but the full comp ‘R’ model was only slightly different and the ordinary club rider would be hard pushed to tell the difference. 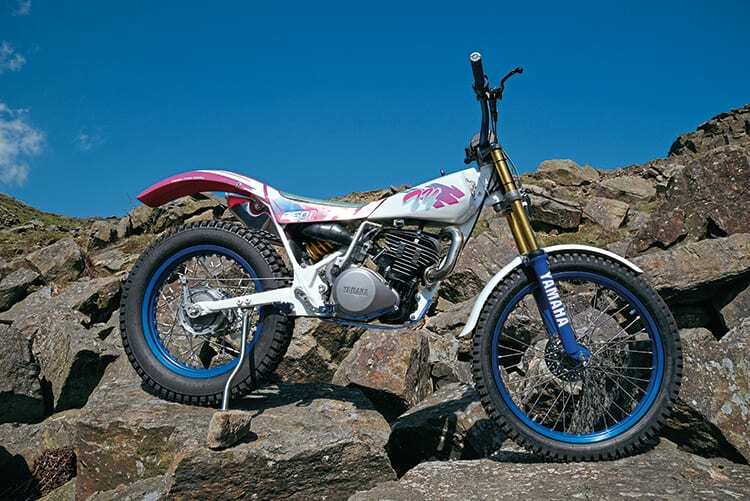 It was light, responsive and ultra reliable – in short it was a machine that changed the trials world like the Bultaco Sherpa did 20 years earlier, or the Fantic 200 a few years before Yamaha, the TY 250 Mono was ground-breaking and nothing was the same from then on. Almost as soon as the model hit the dealers there were people doing bits and pieces for them to improve the breed, the street model could be stripped to emulate the racing version, brackets removed, lights pulled off and even the bulky petrol tank wasn’t a major problem to success, though the slim plastic comp tank looked oh so much better.